"Its vivid detail paints an unforgettable picture..."
The year is A.D. 882, and in the medieval kingdom of Speyron, infertility plagues the people. Rumors abound. Some whisper that the kingdom is cursed, others that the people are on the brink of rebellion, and still others say that the kingdom will soon be ruled by a new king. The current king of Speyron, a young and handsome bachelor, seems oblivious to the plight of his people and unconcerned with the rumors as he monitors the gathering army of the neighboring kingdom preparing to wage war against him. Can he repel this invader? What must he do and what alliance must he make to ensure the safety of his throne? Some of his advisers believe that a serf, a lowly woman from an obscure village who has visions of the future, may have an answer. Will she help him? And does he want her help? "...but my advisers do not believe that we can repel the army that will soon attack us. They all believe that my reign is at its end, and it is so unfair, for it has just begun. I resent that a man like my father was granted a long reign and no doubt will be thought well of for the years of peace he maintained through bribing our enemy. If remembered at all, I will be known as Christian the Lacking, the king who lost Speyron as soon as possible." Buy direct from the publisher and receive it now! 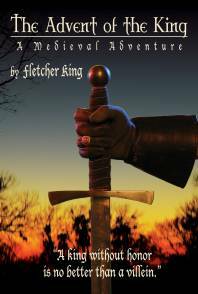 "This 685 page work of medieval fiction is set in the feudal world of the late 9th century. The time period predates the Crusades, heraldry, courtly love, romantic ideas of chivalry, and even the Church’s rise to supreme power. I describe this story as a medieval adventure; it is not history, nor historical fiction. It is easy to read, fast-paced, and suitable for adults, for, true to the human condition, it contains mature subject matter and also scenes of violence and graphic sexual content." Historically, books have always been expensive due to the cost of hand copying them on animal skins. Books therefore were treasured possessions because only the truly wealthy could afford them. Today, prices are better due to the availability of paper and computer technology. However, they are still not cheap. The Advent of the King is approximately 700 pages, and therefore the printing cost alone is more expensive than a comparable book of fiction of half its length. Fletcher King is from East Texas, is a member of MENSA, and holds a Bachelor of Arts in English Literature from the University of the South in Sewanee, Tennessee. To read chapter 1 please fill out our how did you hear about this site form. Upon your form submission you will be directed to chapter 1 of "The Advent of the King".